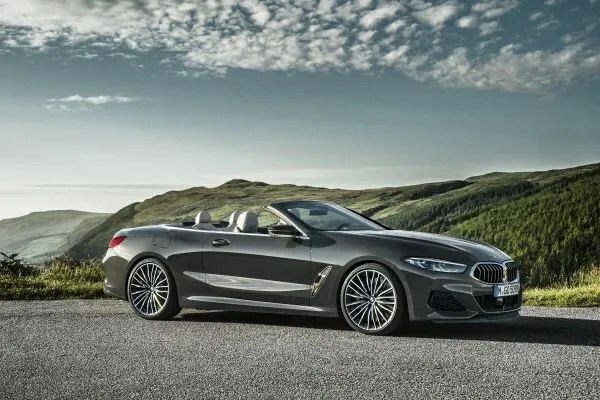 The BMW 8 Series Convertible is on sale in Ireland from April 2019, with on the road pricing starting from €127,690. There will be two versions available from launch: a V8 petrol engine in the 530hp BMW M850i xDrive version (from €181,400) and a 320hp six-cylinder diesel in the BMW 840d xDrive. Adaptive M suspension with electronically controlled dampers is standard, as is BMW’s Integral Active Steering – a system that turns the rear wheels (at speeds of up to 72km/h) to improve agility as well as reducing the turning circle. The fully electric soft top roof opens and closes in 15 seconds at the touch of a button and when travelling at up to 50kmh. Standard specification for the new BMW 8 Series Convertible includes the BMW Individual Merino leather trim in an exclusive Black with piping in BMW M GmbH colours. There is also an anthracite BMW Individual headliner, M pedals and floor mats with special M surrounds. BMW Intelligent Personal Assistant and a Harman Kardon Surround Sound System featuring 12 speakers are also included as standard.